Halifax coach Richard Marshall was pleased to see his side had ‘more in the tank’ than Whitehaven as they won 30-10 in Cumbria on Bank Holiday Monday. 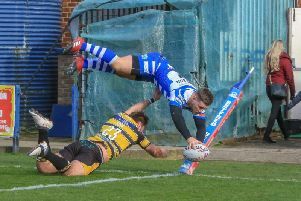 Three first half tries laid the platform for a solid win as Fax ended a six game losing streak to win their first match of the Championship Shield. “Winning was important today,” said Marshall. “It’s no less important when you’re playing against a team who are fighting for their lives and they were desperate today and good value. Marshall handed a debut to another recent graduate from the successful reserve grade team, Luke Nelmes, while youngsters Chester Butler and Nick Rawsthorne both got their first tries for the club. “I must gave praise to the young lads who came into the team,” said Marshall. Despite winning by a fairly comfortable margin, Marshall’s side struggled to complete their attacking sets, something he is aware they need to improve. “We had to defend well for long periods because our ball control wasn’t good enough,” he said. “We coughed up the ball on tackle one and two and our game management wasn’t there and we needed our half backs to be more dominant. “There has been a lot of effort recently but we haven’t got the win over the last few weeks but we had a bit more in the tank today than Whitehaven. “I’m here for the long term. “Short term – yes – we want to win every game but long term we want to develop players from the local area and part of my philosophy is developing young players.